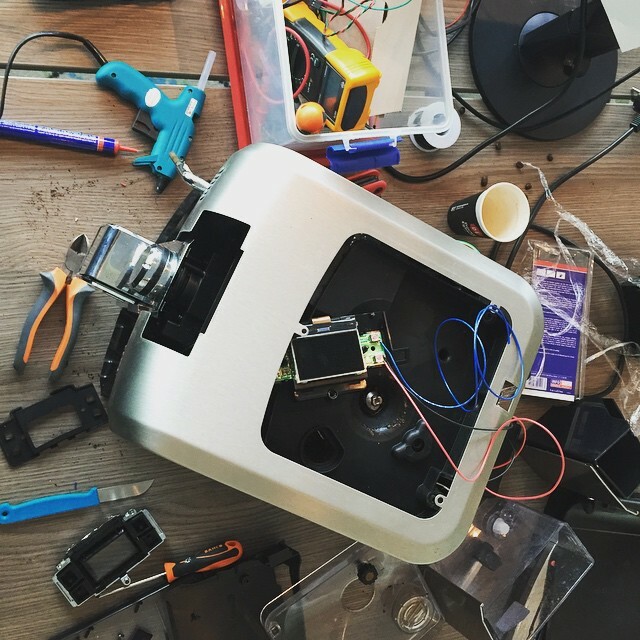 My friends over at Sanoma organised a small hackathon last week, and asked me if I wanted to join. I looked at my bucketlist of projects, and saw my espresso machine gathering dust, so an idea was born. 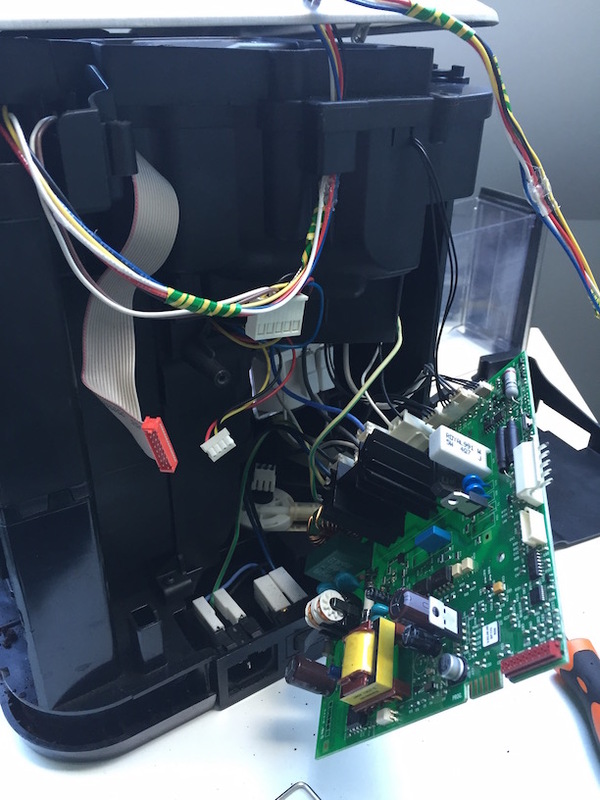 Why not create a wifi enabled Espresso machine, which you can remotely command to pour you a coffee. By popular demand, watch the video! Once I finally could reach the push buttons, I could just measure the correct pins, solder a ground pin, and some signal wires onto those ports, and close everything up. The way this “hack” works, is basically that we will be ‘short circuiting’ the push buttons. When you physically push the button, a connection is made between the ground pin, and the signal pins. On those pins, I just soldered some extra wires. 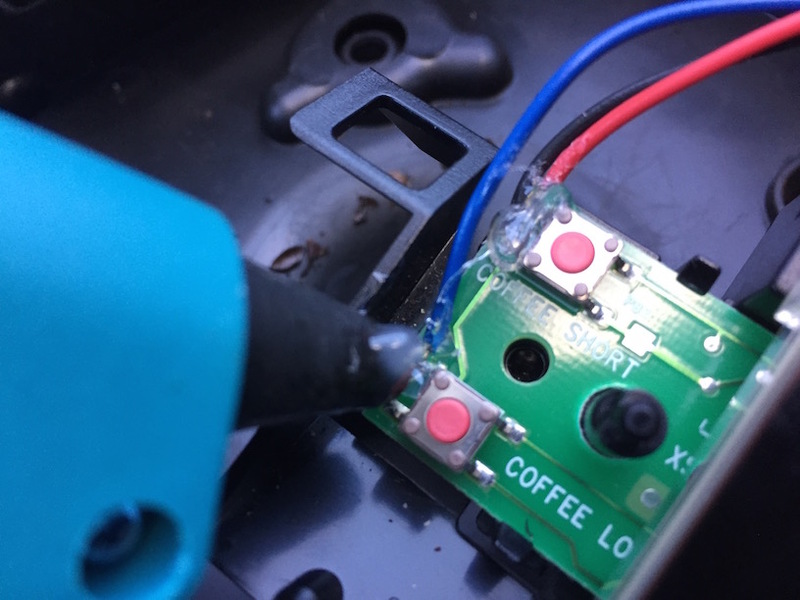 On the Raspberry Pi, when we make the GPIO port -low- in our software (eg: 0, not 1), you actually just connect it to ground (“Pulling it to ground”), which will trigger the software in the Espresso machine, just as if you were pressing the button. You can do this “hack” on any device that has these kinds of push pins. You just need to find which pin they trigger, and whether they are pulled to ground (0) or high (1). It’s pretty simple to find out which is which. Find a ground pin somewhere (a dead giveaway, sometimes they actually say ‘ground’ or ‘gnd’ on silkscreen on the pcb. Usually all the push buttons will share a ground (a common ground). 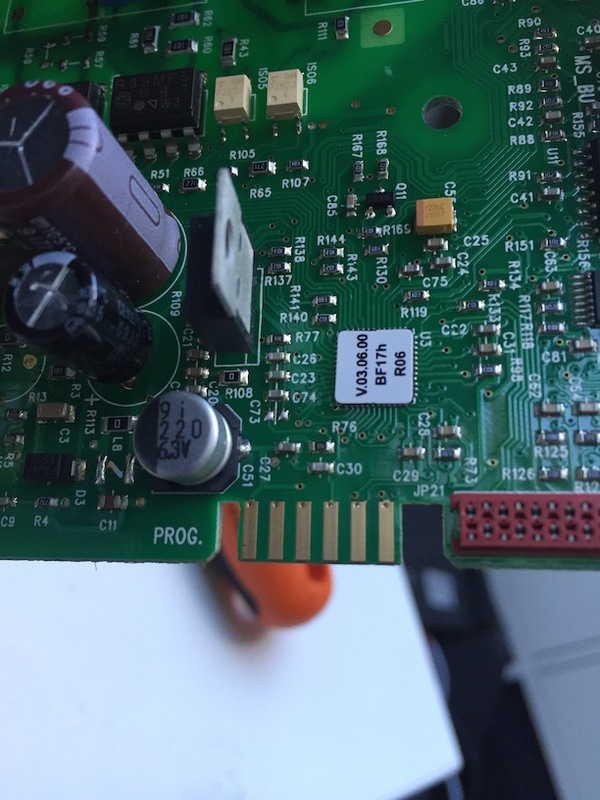 That’s pretty easy to find: use either the signalling function on your multimeter (the ‘beeping’ thing), or check the ohm meter (if it’s near 0 or 0, there probably is a connection). In this way, systematically loop through all pins, while you keep one of the measuring pens on the same pin all the time. Once you find a connection, you’ve find the ground pin, the other pin is the ‘signal’ pin. You can check by switching the pins, and pushing the button, if a connection is made, you’ve found both pins. So now we hotwired all the buttons. 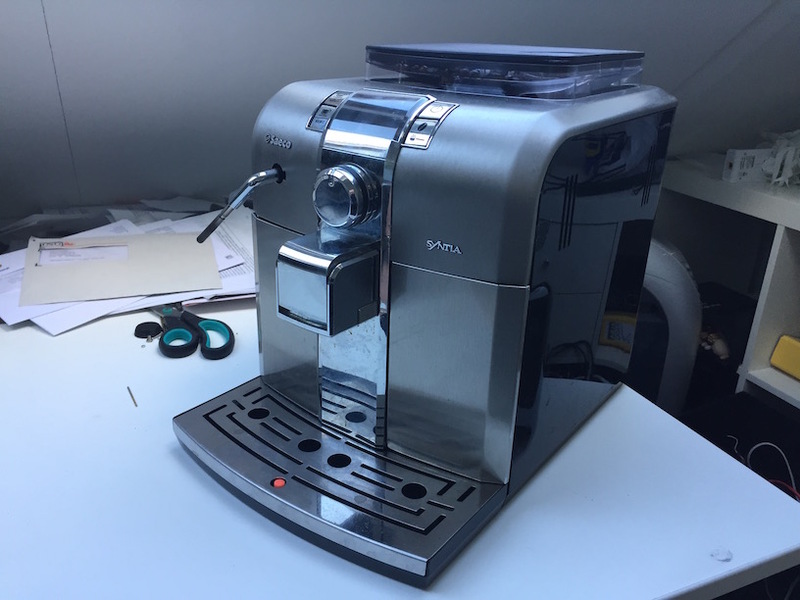 We can get the machine out of standby (or bring it into standby), adjust the amount of milled beans, pour a cup of regular coffee, or pour an espresso, right from the Raspberry Pi. I glued all the solder joints with some hot glue, just to be sure. I didn’t want to open the machine all the way back open again because of some poor soldering on my part (booh). There is also a flat flex cable running all the way to back, which I could have used (but didn’t want to bother checking all the pins), I used the plastic clips from the flat flex cable to tug away the extra wires all the way to the back. While I was soldering like there was no tomorrow, my friend Sjoerd Arendsen was already working on the api part for the project. I wanted to use Flask for the api, but he had more experience with Django Rest Framework, so went for that. We decided on just supporting GET calls for now (boohoo!). You can find the whole source code on Github, but it’s not much. 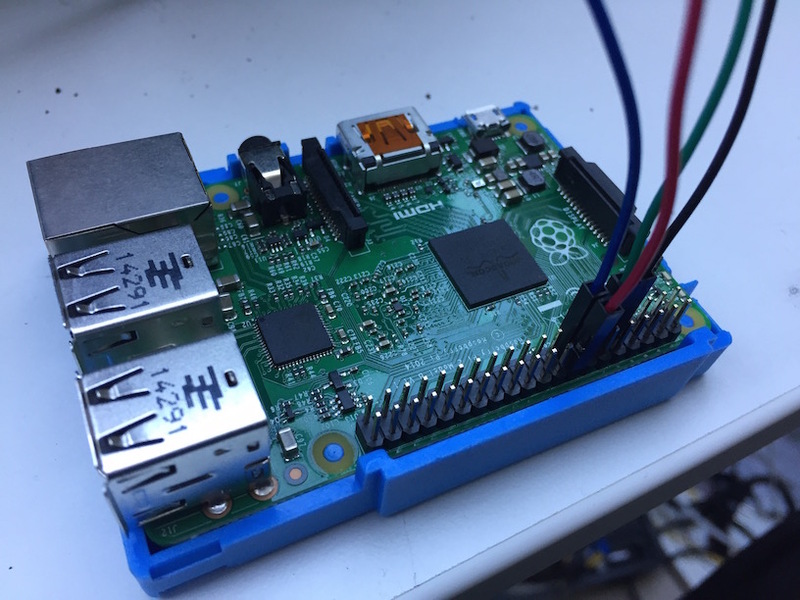 When you connect something to the Raspberry Pi, you can’t just use any gpio port. 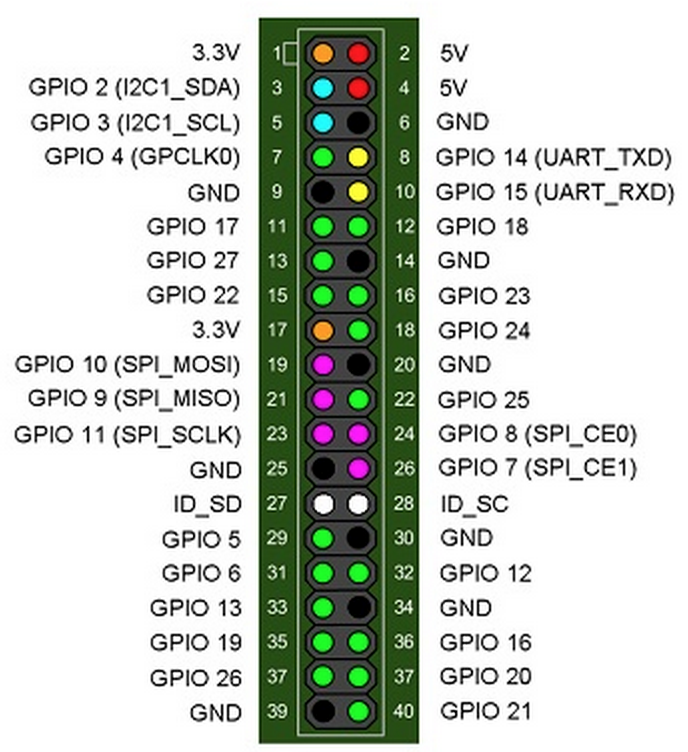 Some gpio pins actually have a specific function (I2C, SPI, etc) by default, and you should only use or overwrite those if you know what you’re doing. Since we just needed a couple of random ports, we selected some green ports from this diagram (the green ones are free to use). We had some timing issues with the push buttons, but we got it to work after some debugging (blast! A realtime device like an arduino or other AVR would have helped here). Automatic cup dispenser: with a tube, some plastic cups, and a servo, create a little latch which would dispense one cup on the stand.